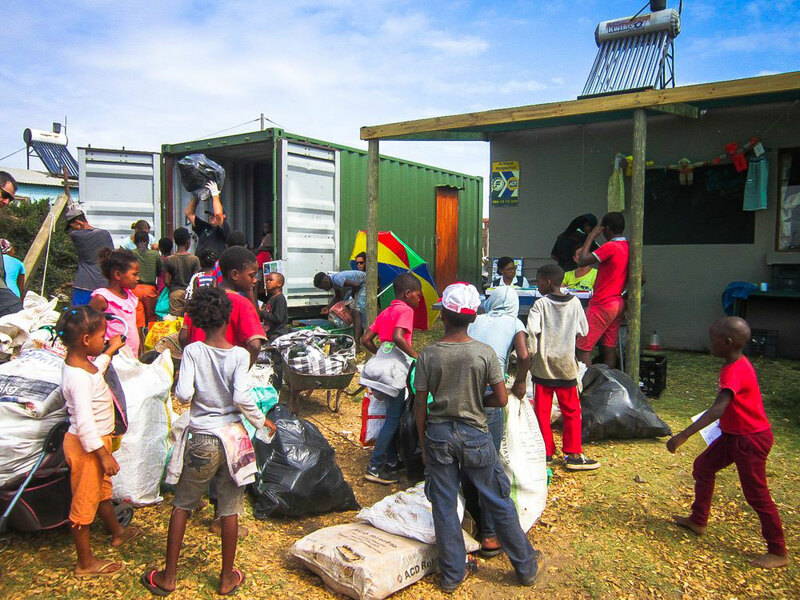 So far this year, there have been 8 trading days at JBay Recycling Project and 1,289 kids have seized the opportunity to turn 12,5 tonnes of trash into treasure. 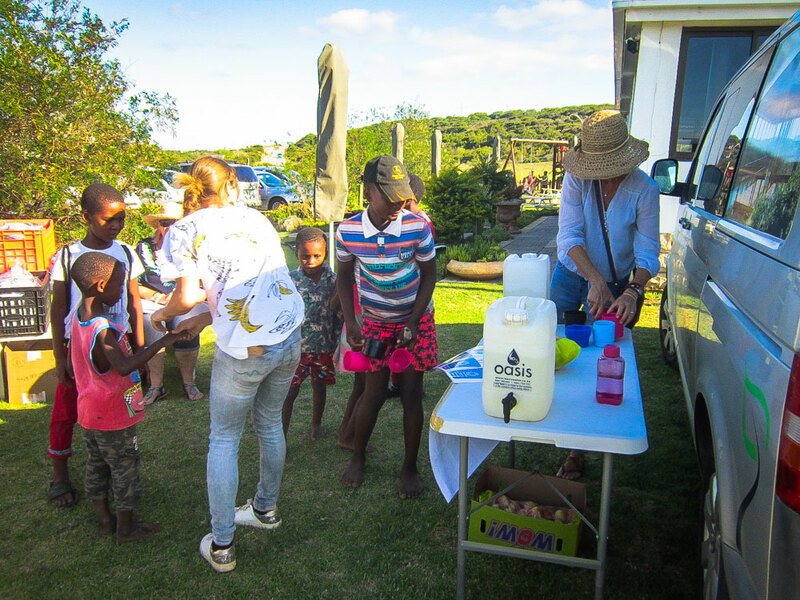 The year started off with a “hip hip hooray” as JBay Recycling Project celebrated it’s 8th birthday in January. Green Earth Landscaping created a stunning new section of garden with plants donated by the Supertubes Surfing Foundation. Among these were 8 symbolic Spekboom – small, tough Carbon converters, just like the children of Jeffreys Bay. 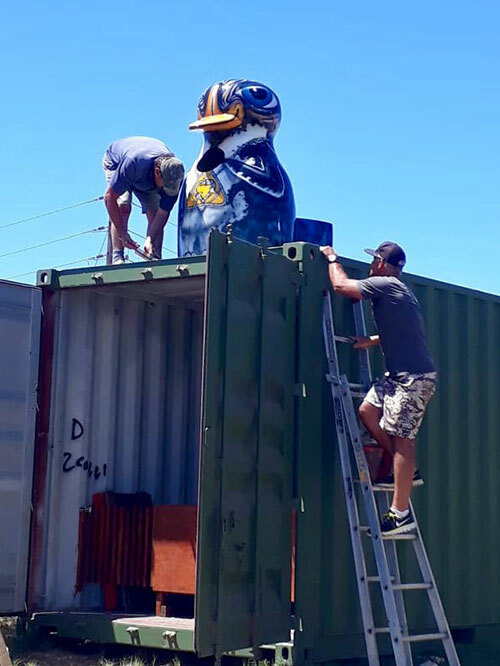 Two of the well-known recycling penguins now reside on top of the on-site containers, serving as mascots and signposts to new visitors. Thanks must go to Carina de Flamingh, the founder of this project, to all the crucial and benevolent sponsors and to the children who are a true inspiration. We officially started accepting EcoBricks this year. Have a look at http://www.ecobrickexchange.org for info. The children earn 5 Mula for every completed EcoBrick. It has not been plain sailing, but those who had doubts about this initiative were converted when little Abraham brought in 23 EcoBricks and earned the bicycle he has been saving for for over a year. Local residents have commented that they are very glad to see that the chips packets, etc. being collected from the streets, fields and beaches. We do not currently have a building project plan, and assistance would be appreciated. In February, a concerned staff member at Pellsrus Primary School informed us that learners from Kabeljouws/ Smithtown need school uniforms. They live too far away to attend our regular trading days. Suikerbossie Padstal very kindly agreed to allow JBay Recycling Project to use their premises for our first Pop-Up Swop Shop during the school holidays. Children had the opportunity to swop recyclable material for school uniforms. It was a roaring success, with 25 children being kitted out and ready for school to start. Every participant also received a smart bag donated by Billabong and a pair of undies to complete their outfit. 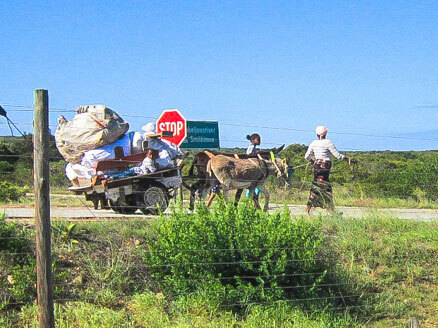 The donkey cart was much fawned over and the day was enjoyed by all. Everyone wants to know when the next one will be.. watch this space. Our trusty scale, kindly donated by the Rotarian Club, finally gave up the ghost after many years of service. A brand new scale, funded by Jeffreys Bay Wind Farm, is ready to start working on Monday 8th April. Our dear friends Victoria and David agreed, probably against their better judgement, to transport 9 boxes of school clothing in their car from Johannesburg to Jeffreys Bay, ready for the new term. Thanks to them and to funding from Jeffreys Bay Wind Farm especially, anoraks will also now be available in the swop shop, along with the rest of the school uniforms. Our first adult clothing and household item sale of the year was held on April 3rd. As always, Bernie worked like a Trojan to collect, organize and advertise this popular event. Over R3,000 was raised, to be used towards clothing for the children and wool for Winter wear. Creative and dedicated well-wishers have been knitting and crocheting up a storm and we have received loads of beautiful woollen items: breathtaking blankets, funky gloves and the cutest teddies imaginable. The weather is getting cooler and the kids are always over the moon when they walk out with that unique and special beanie or pair of gloves. You guys are the best! Once again, the local restaurants who lovingly provide a nutritious meal to all the kids on trading days have recommitted their support. They are Ocean Basket, Driftwood Cafe, Infood, Global Junction Cafe and Nina’s. The Petite Sunbird Bakery are donating delicious cake on the last day of each term. Food Lover’s Market have also pledged their continued support and the children will receive fruit with each visit. Thank you all for seeing value in supporting JBRP. 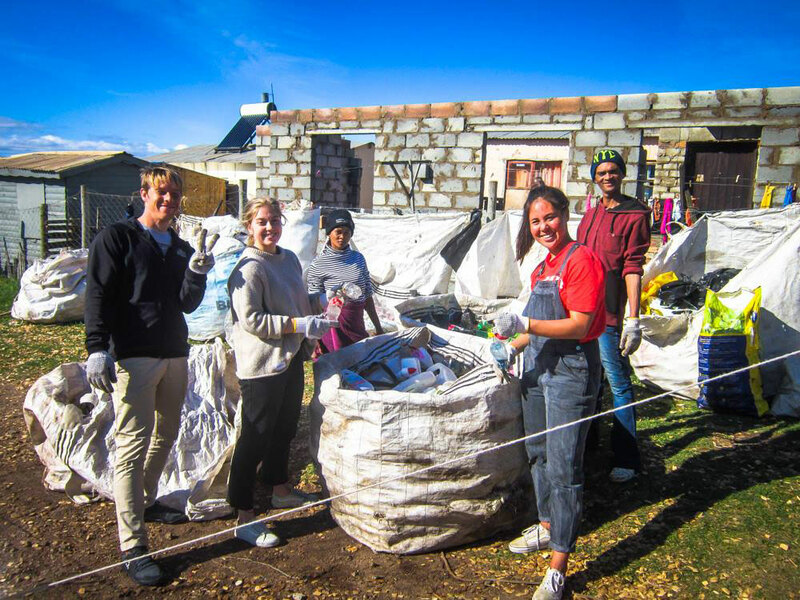 The volunteers are what makes this project work. There are so many and each person is appreciated for their specific approach and personality. One thing they all have has in common is the empathy with which they approach the kids, determined to make them feel important and proud. Joining this lively, diverse and welcoming group is great therapy and a sure-fire recipe for gratitude. If you would like to help out in any way, from stock donations to volunteering, info can be found on the website http://www.jbayrecyclingproject.org or 084 684 6771.